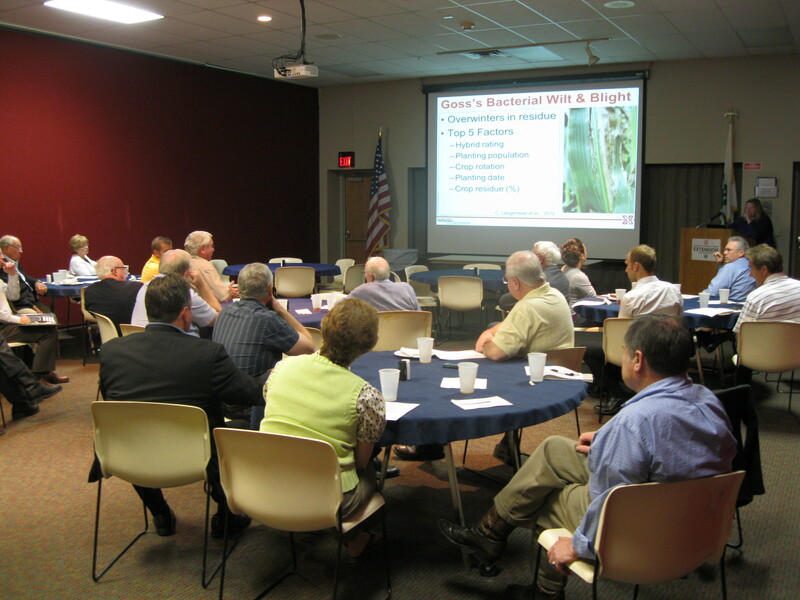 Missed the October 1st Nebraska Agribusiness Club meeting? You can catch all of the content from Dr. Tamra Jackson-Ziems’ great presentation on these two videos (they are split into PART 1 and PART 2). If you’d rather just read about her discussion points, click here. Mycotoxin, aflatoxin, ear & stalk rots, Goss’s Wilt and drought were the main discussion points given by Dr. Tamra Jackson-Ziems at the October Nebraska Agribusiness Club meeting on Monday. This discussion was especially timely as the heat and drought of the growing season this year, that spured the growth of many mycotoxins which affect corn in Nebraska. However, Dr. Jackson-Ziems assured the club that we have mycotoxins every year, but the talk of aflatoxin has gotten many people worried. The concentration of mycotoxin in grain is influenced by fungal infection, growing conditions and plant stress. Mycotoxins can still survive in distillers grains after corn has gone through the distillation process as they are heat stable – however their concentration increases 3 times by volume in the distillers grains. 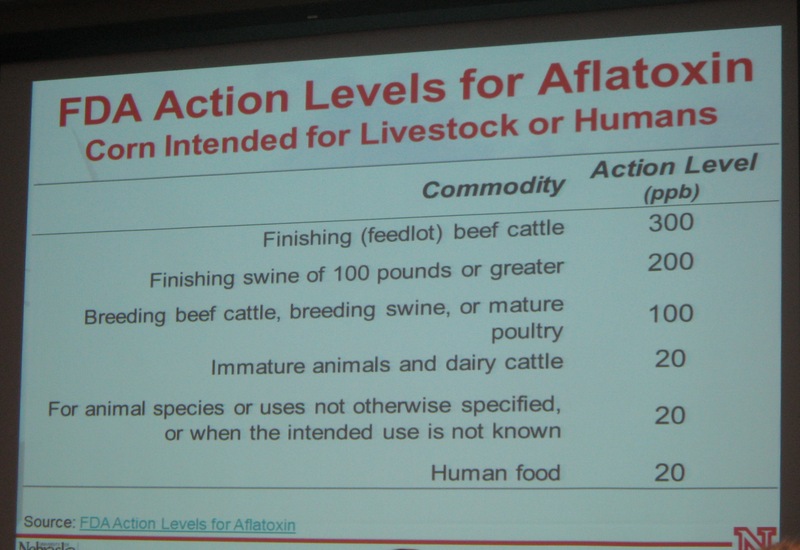 One major point to remember when talking about aflatoxin and that is the FDA Action Levels for corn intended for livestock or human use. The following picture shows the parts per billion (ppb). Dr. Jackson-Ziems worked with a colleague who collected samples of corn in a 100 mile radius of Lincoln and found that 42% of those samples had no detectable aflatoxin at all. In 80% of the samples, the corn showed less than 20 ppb of aflatoxin – which according to the chart above, is completely safe levels. In 99% of the samples, aflatoxin was less than 100 ppb which is perfectly safe for livestock feeding. So even though there are rumors and concerns about aflatoxin in this drought year, this study has confirmed the safety of the Nebraska corn crop. To watch Dr. Jackson-Ziems’s presentation, check out our YouTube channel.